Using a new unbiased technique to calculate dark matter, a new study from a team of astronomers suggests that there are large amounts of invisible dark matter near the Sun. Astronomers at the University of Zürich, the ETH Zurich, the University of Leicester and NAOC Beijing have found large amounts of invisible “dark matter” near the Sun. Their results are consistent with the theory that the Milky Way Galaxy is surrounded by a massive “halo” of dark matter, but this is the first study of its kind to use a method rigorously tested against mock data from high quality simulations. The authors also find tantalizing hints of a new dark matter component in our Galaxy. The team’s results will be published in the journal Monthly Notices of the Royal Astronomical Society. Dark matter was first proposed by the Swiss astronomer Fritz Zwicky in the 1930s. He found that clusters of galaxies were filled with a mysterious dark matter that kept them from flying apart. At nearly the same time, Jan Oort in the Netherlands discovered that the density of matter near the Sun was nearly twice what could be explained by the presence of stars and gas alone. In the intervening decades, astronomers developed a theory of dark matter and structure formation that explains the properties of clusters and galaxies in the Universe, but the amount of dark matter in the solar neighborhood has remained more mysterious. For decades after Oort’s measurement, studies found 3-6 times more dark matter than expected. Then last year new data and a new method claimed far less than expected. The community was left puzzled, generally believing that the observations and analyses simply weren’t sensitive enough to perform a reliable measurement. In this latest study, the authors are much more confident in their measurement and its uncertainties. 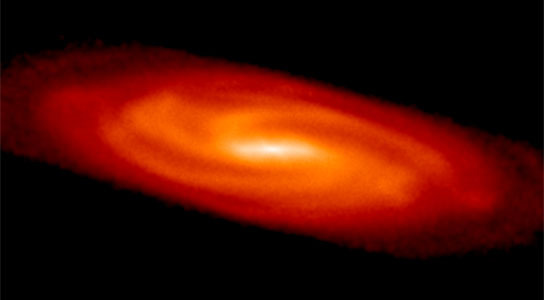 This is because they used a state-of-the-art simulation of our Galaxy to test their mass-measuring technique before applying it to real data. This threw up a number of surprises. They found that standard techniques used over the past 20 years were biased, always tending to underestimate the amount of dark matter. They then devised a new unbiased technique that recovered the correct answer from the simulated data. Applying their technique to the positions and velocities of thousands of orange K dwarf stars near the Sun, they obtained a new measure of the local dark matter density. Many physicists are placing their bets on dark matter being a new fundamental particle that interacts only very weakly with normal matter — but strongly enough to be detected in experiments deep underground where confusing cosmic ray events are screened by over a kilometer of solid rock. Be the first to comment on "New Measuring Technique Suggests Plenty of Dark Matter Near the Sun"